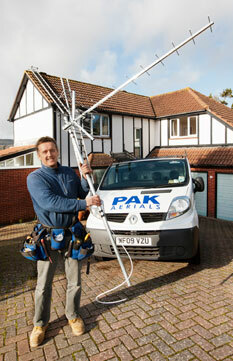 Established for over 40 years PAK Aerials offer a complete service for upgrading your aerial from analog to digital and also include interior cable work keeping it tidy and simple. Based in both Sidmouth and Exeter we are ideally position to help with your aerial installation requests across East Devon, working through to Exmouth from Sidmouth across to Honiton and the Ottery St Mary Area. All of the engineers at Pak Aerials are CRB checked and CAI plus, and RDI trained.